combines fun and awareness in her popular early-grade classes. She feels that this is why her own early dance training was such a joyful experience. 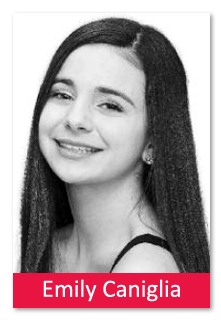 Beginning at the age of 2 1/2 at our Dance Center, she studied with Tiffany Panarello, Karen Giorgio, Nicole Angelastro, Gerry Barney, Norma Jean Frumento and Linda Polvere. Her love of dance and hard work provided her with the skills to become a member of the Marcia Hyland Dance Company and our teaching faculty. Accomplished in ballet, jazz, hip-hop and tap, Emily was an obvious choice as Lenape High School’s Junior Varsity Captain and cheerleader throughout her high school years. Her fine dance training made it possible for her to be selected to choreograph half-time and pep rally routines while still in high school. She successfully shares her time between college studies and her classes at our Dance Center, and we know how fortunate we are to have Emily’s experience and enthusiasm to enrich her students’ lives!